If the key to success in your game is tedious repetition, you are not a game designer. You are a torture expert. That sums up many of my concerns not only with WoW, crafting and MMOs in general, but also the recent “Facebook games” GDC kerfluffle. I’d add that “success in your business model” is another valid phrase to slot in there. I don’t usually do this bandwagon thing, but Scarybooster touched a nerve on this one. See, I’m a developer. I’m not looking for cookies (though sending me fudge would be OK) or cards, but let me tell you a little bit about this side of the console. Game Development is a job. It is hard work. It’s packed with thankless iteration, long hours and soul-grinding, mind numbing inanity. We do have our moments, though. It is really great to see something you’ve worked on get to playable form. (“I love it when a plan comes together.“) Even small victories through the day, when some code works or a piece of art actually looks right in the game, well, those keep us going. Many of us believe in the potential of games as not only entertaining (though primarily that), but also uplifting and educational. Putting something you created out into the wild and watching it make people happy is a boon to the soul that few things in life can match. We love it when people pay our salaries, to be sure, but those sterile numbers on the quarterlies don’t tell the human story. The occasional blog post or Facebook blurb where someone praises our games are islands of refuge in a sea of grumpiness. The few times I’ve had someone chime in here on the blog that they liked a game I worked on are delightful. Most people like to know that their work is appreciated. And y’know, it really doesn’t take much. I don’t think I’ve ever had the Boss bring an email or letter to a company meeting, sent in by a fan to praise our work. Sure, Blizzard has people falling over themselves to praise their name, but they aren’t the only people who make games. I can almost guarantee that even taking five minutes to send an email or “real” mail to a company, praising their product, will be much appreciated by the sometimes forgotten devs. We’re not greedy, we just like to be liked and appreciated. Fudge is good, but a brief “that was an awesome game, dude!” is candy for the soul for the guys in the dev trenches. Thanks to the Three Rings crew, mad geniuses behind Puzzle Pirates. Special “mad props” (what does that even mean?) to Apollo, Demeter, Nemo and of course, Captain Cleaver, and a huge round of applause from me for the whole dev team and the dauntless Ocean Masters. The community around Puzzle Pirates is particularly tight knit, it seems, and these folk keep making great additions to the game, and keep the community rolling in good will. That may not show up itemized on the quarterly financials, but it’s as good as money in the bank. Individually, I’d like to tip a hat to the good Brian “Psychochild” Green. He and I don’t always see eye to eye, but he’s taken time out of his crazy days to communicate with me on a handful of topics, and I find his insight to be valuable and interesting. If you’ve not http://www.psychochild.org/ yet, might I recommend it highly? To everyone who has chimed in with a comment here about games I’ve worked on, thank you. Words on a website may not look like much, but the goodwill behind them is always felt and appreciated. And, if I may, to anyone who has enjoyed a game for any reason, please consider sending a nice email (or more if you feel like it, to be sure) to the guys and gals who made it possible. In an age of megapublishers and blockbuster games, sometimes it’s easy to ignore the real people doing the work. Heaven knows I’ve forgotten too many times, and I’m no stranger to either side of the fence. We could all stand to be kinder, and going out of your way to praise someone is healthy. Larisa has a great post up on making your own Cataclysm while you wait for Blizzard to release the real thing. I highly recommend it, found thisaway. Her bonus link to Ixobelle’s PvP adventures is worth following as well. Commenting on her post, I noted that I would love to see Blizzard really shake things up in the industry by changing business models. 1. Instead of consigning the Old World of WoW to the digital scrap heap, slice it off into its own phased existence and sell it as a standalone subscriptionless product. Call it “PreCataclysm Azeroth” and watch it sell like hotcakes and introduce a new batch of newbies. It’s like a free trial on steroids… that you can charge for. Forget a piddling $1 for a week, try $30 for a lifetime sub, a direct stab at the market that GW has had mostly to itself, and a kick in the teeth to those other guys who sell lifer passes. OK, OK, I’ve written about this before, and I doubt that they will follow my admittedly selfish wishes on this, but I’m really very curious as to whether they might have some sort of long-term plans along these lines. Not that I’d mind, mind you… Still, with a new MMO in the pipes that may well cannibalize their WoW base, it’s a good time to start tinkering. The natural split of “old Azeroth” and “Cataclysmic Azeroth” is a perfect vehicle to segment the market a bit and diversify their death grip on the industry. 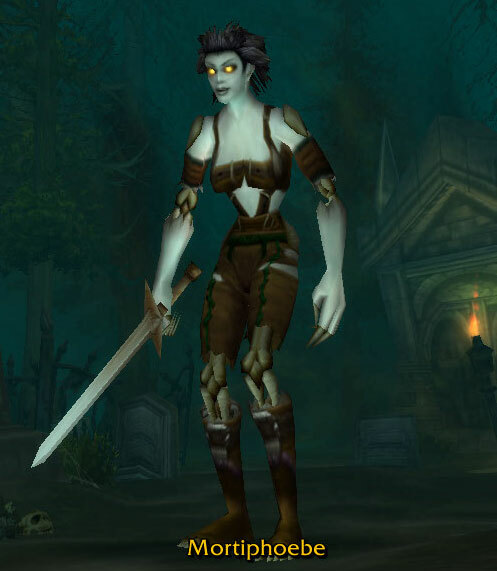 Some time ago, I agreed to Ixobelle’s curious suggestion (seconded by Spinks) to try out an Undead Warrior for another spin through Azeroth. When I read of a blogger guild, curiously named Single Abstract Noun (SAN), I thought I might poke my abnormally large nose into matters that were little of my business. (Though as Pitrelli and Hatch rightly noted, SAN is a recipe for a wee bit of drama, as might be seen of late, but hey, it’s fascinating either way, even if I’m just on the proverbial sidelines.) It turns out that trial accounts can’t join guilds anyway, but so it goes. SAN plays on Argent Dawn, a “Role Playing” server, so I spent a bit of time reading up on the Forsaken and the Scarlet Crusade, trying to craft a backstory for my little undead lady who was deathly afraid of the undead (hence the name she chose for her new self, a delicious portmanteau mixture of “cute, perky and emo”… or something like that). I’m sure my lovingly crafted story of a former Human Priest who joined the Crusade to fight her irrational fear of the Undead, only to be turned to the Undead in a botched operation, was the stuff of legend and totally original, but I wisely chickened out of playing it to the hilt. Sure, it explained why she was a Fury Warrior, totally shunned by her former allies and the Light, driven by blind fury to destroy those nasty tricksy Undead that she was now surrounded by… and it even played into my own rather soloist tendencies, but in practice, since she couldn’t attack those of her own newly adopted faction, it just didn’t work out. When a random Forsaken player kneeled to Mortiphoebe, that sealed the deal. If a random stranger in an Undead body took the time to welcome my little zombie into the fold, well, the RP was irrevocably broken, and I just went ahead and played the dang game. See, Mortiphoebe as I’d imagined her would not have calmly nodded at the stranger as I told her to in the game, she’d have whipped out her two handed sword and lopped his ugly little Undead head clean off and then stomped on the rest of the corpse and scattered the bones, then shrieked until she was hoarse, running into the forest. (Of course, that she didn’t do that to the NPCs was easily attributed to shock and the fact that they didn’t actively talk to her. It’s a whole new level of interaction when a player takes the time to stop and do something welcoming.) Irrational paranoia and fear of your own faction doesn’t work in the WoW RP framework, even if they weren’t trope-laden emo gibberish to start with. Sooo… I’ve played another ten day trial with this character, hot on the heels of playing Allods Online. I’ve gathered some notes of comparison, and have a few things I’d like to dig into from a game design and art perspective. That means more articles in this vein, likely all titled “Dead Again: Subtitle”… and lest one get the impression this is now a WoW blog, I’m done with the ten day trial, with no current intention of proceeding further. I have a few other articles in mind that I’ll toss in between the DA series, too. After that, I hear the Meridians are worth exploring, and I really want to see what I can tease out of the 59th one. Since that’s sort of what I do. Play, analyze, write. It’s like going to a movie; I’m trained in CG animation, I can’t help but analyze the things. It’s really hard to just go along for the ride. In the meantime, though, a quick vignette that might explain a lot about just how hapless I was. I tried out the Random Dungeon Finder when the tutorial tips prompted me to at level 16. I wound up in Ragefire Chasm with some of those other players. It turned out to be fun (gasp! ), and we steamrolled the boss. It was my last night of the trial, so I signed on for another random dungeon, and we wound up in Deadmines… whereupon, after downing one boss, we promptly wandered into a pack of goblins and wound up wiping. I’ll write more on that later, but what struck me as interesting was after that. I “released my spirit” and wound up in a graveyard out in Westfall. I’d never been there before, so I was totally lost. I saw a player outnumbered by some sort of piggish bipeds, so I went to investigate. Her guild tag proclaimed her to be a part of SAN, so I figured I’d go help, though it took me a while to get there. I killed one of her assailants and then wandered off again into the unfamiliar hills. She thanked me and I nodded. Only after I looked back did I realize that she was playing a Gnomish character. Y’know, one of those Alliance mooks. It must have been baffling for her, seeing a Forsaken come in and help, then wander off. What can I say? I was lost. Um… I was Alliance once? For the Alliance? Rah, rah, team? Gooooo Varian? Nice ‘do, who does your hair? So, Steelspark of SAN, sorry it took me a while to get there to help (but you survived, which is all I was really angling to help with). Here’s hoping your evening went well. Don’t mind the unguilded teenaged Forsaken who looked lost and incompetent. First impressions can be misleading… or accurate. It’s not worth worrying about which.